Certainly laziness. As stated I planned to only report brews and news I felt significant, unusual, noteworthy in some way. With that thought one would surmise that I have nothing of significance to report since last March! On the contrary! I have been actually quite busy brew wise. Just to lazy to write it down. I knew I would not be very good at this blog thing. Perhaps as the leaves are preparing to fall here I shall turn over a new leaf. Some highlights of what I have been up to since last spring. Competitions, I have taken ribbons in 3 of them since last Spring. 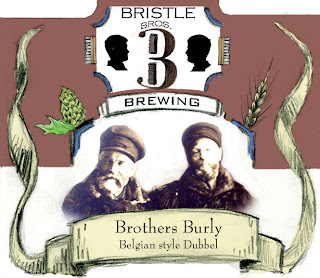 I took a 1st place for my Bitter ol' Woodchuck APA and a 2nd for my Brothers Burly Belgian style Dubbel at the Littleton Homebrew competition in April. I entered the Green Mountain Homebrew comp. for the first time this year and took a 2nd place in the English Brown category for my Quarryman's Mild ale. My latest win was at a brand new competition at the Lancaster fair sponsored by the Granite Cask of Whitefield, NH.. I took home a 1st place for my Fairfax Falls Fog beer (a steam™ beer) in the lager categegory. 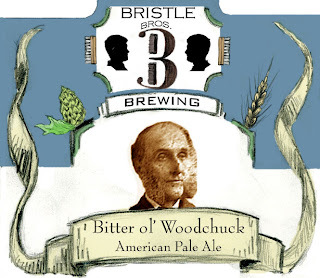 Another win for my Bitter ol' Woodchuck APA this time bumped to 3rd in the Pale category. Lastly another 1st place in the Harvest cup category for my Ryanna Red. It was a red ale brewed with rye malt and large amounts of my homegrown "wild" hops. An uknown cultivar I have growing from some locally found rhyzomes. The Harvest Cup category is for beers brewed with homegrown ingredients. I had hoped to enter my Gorm Diahbol a traditional Pictish heather ale. Sadly it was not a good year for my heather. I had some dried from last year and a bit of fresh flowers but it was too late by the time they were ready and I really feel fresh is best. Anyhow, the Lancaster fair comp had some really great prizes in addition to the ribbons. Thanks John! The judging sheets were not particularly helpful sadly. Very little commentary mostly just check marks. John reported that some of the judges were perhaps too harsh. I only had one such sheet. The judge slammed my Quarrymans mild a 16/50! The beer that took second at Green Mountain... But no faults were cited?! Oh well. All in all though for the first compitition I think it was really well managed and will certainly enter again. Getting some brews bottled now for the upcoming New England Regional Homebrew comp. in Maine. Went to the VT. Brewers fest and camped with some friends there. That was a blast. I would say the highlight of the brews there was everything I tasted from Brasserie Dieu du Ciel. FANTASTIC! Brews. 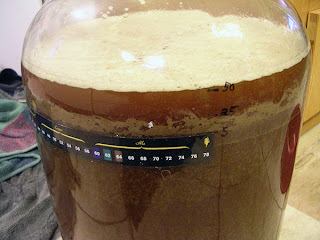 I have kept up brewing, lately not as much as I wanted but I have not been out of beer at least. I attempted meads again this summer. Not very optimistic. 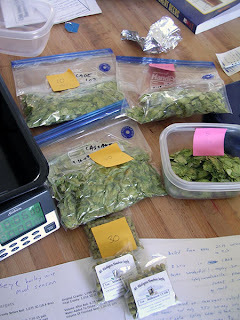 Brewed many old favorites and developed some new recipes. Beers of note that I may or may not post about... Smoke in the Sugarhouse! My first smoked ale. I have grown quite fond of smoked beers this summer after trying Schlenkerla Marzen and Urbock. Yum. Mine is a smoked amber ale with a maple flavor. Did my first "wet hop" beer this year. Actually a wet/dry. Wet kettle hops and then dry hops in the keg. I have yet to try it. Another new one for me that is perhaps not noteworthy or unusual is my milk stout. Turned out fantastic though. Barley wine time is coming up and I will certainly update on Mud season Barley wine and soon be dry hopping then tapping the harvest barley wine from last year. That will be on Samhain. The biggest news (obsession) in my brewing world these days is CIDAH! I took a week long cider making workshop with English cidermaker Peter Mitchell this past August. It was fantastic. Learned a lot and got to meet some great folks in the cider/orchard business in VT. as well as some other homebrewers. I would like to thank Eleanor and Albert Leger of Eden Ice Cider for their work in bringing this workshop here to VT and especially for letting me know about it! There ice cider is superb, definitely check it out if you see it. I have done a lot of reading and research online about cider and particularly presses and scratters. There is some good info but I feel there is nowhere near as much as there could be. Certainly not the glut of info here is on beer. So I suspect I will put in my 2¢ if I don't flake out again. Okay, well feast or famine right? Guess I'll leave it at that for now. Birdseye Barley wine. Mud season. Let's see if I can remember what happened! Here we have the gravity reading for my partially boiled strike/sparge water (sap). It came out to be 8 degrees brix or a specific gravity of 1.028. I had a real brain melt trying to figure out how to account for this initial sugar in my recipe calculations. I ended up plugging 1 lb. 8 oz. pure cane sugar into the recipe to stand in for the sap. Calcs in the program called for 10 gallons of actual water (1/2 gallon more than I had) so I boiled some extra spring water just in case I needed to adjust. I am now adding to this many months later. I am a bit fuzzy on the details so... I know I have notes somewhere, just have to find my notebook. Perhaps I will update again. Anyway, with the facts I do have from my computer I will sketch out what happened. My preboil gravity target was 1.075. My sugar substitution in the recipe formulation was a bit off the mark in accounting for the sap as my actual preboil gravity was 1.088! I could have diluted at this point but I did not bother. Now I ended up with less volume in the end as well. I had 5.88 gallons and was aiming for 6.25 gallons. So, of course my OG ended up also significantly higher at 1.112! Target was only 1.090. Now looking at this photo and seeing I had 5.5 in the fermenter I surely must have diluted? With all that hop matter it is doubtful I could have gotten 5.5 from 5.88. If so, I wonder what the OG was actually?!?! Oh where are my notes! Anyway, the yeast cake from the altbier did the trick again. Carboy go BOOM! Not sure why I thought I could get away without a blow-off. 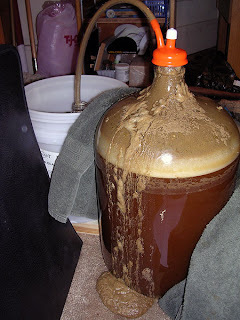 Or then again, I think I did have a blow-off originally it was just so violent it actually blew off the blow-off tube and carboy cap? Whatever the case it was a MESS! Birdseye Barley wine Mud Season begins today! I have collected 18.75 gallons of sap thus far. I have not done any collecting today yet so hopefully I will get my full 20 gallons by the end of the day. For now though the brew is on! Well, the reduction of the brewing liquor (the sap) is anyway. I have been collecting the sap and storing it in my converted keg and a plastic bucket. I removed a few gallons from the keg and currently have a nice rolling boil going of 12 gallons. I have been skimming the surface every now and again. Seems I read that is the practice of sugar producers. I will have to investigate that later. I plan to add a little more at intervals throughout the afternoon until it is all in the pot. Pot only holds 15.5 gallons so I figured I would keep the volume down to lessen the likelihood of boil overs. 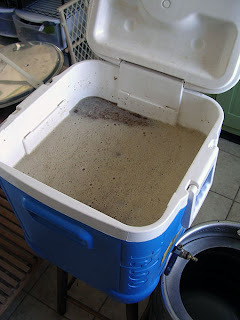 By the end I aim to have 9.5-10 gallons that I will use to mash and sparge my grains tomorrow. As I stated earlier this is my first time collecting sap from maple trees. As such I have tried to be as observant and inquistitive as possible so I could learn. 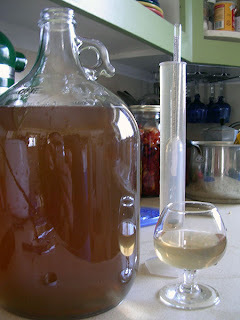 I have taken regular hydrometer reading and volumes to get a feel for how things "flow". Thus far everything has been pretty steady sugar content wise with an average of 3.5-4 degrees brix. The volume collected each day has certainly been flucuating though. Very much dependent on the temperatures. Some days I get a almost 2 gallons from my 5 taps. One day where it was nice and bitterly cold at night then up into the forties the next day I got 5 gallons! These observations are all things that are obviously well documented and I have read about or been told directly. However it really makes more sense and I get a better feel experienceing it first hand. Another such observation is the wisdom of removing the frozen sap when collecting. It made sense to me somewhat but I had to test it out. The idea is that you are concentrating the sap collected because the frozen bits are more water than sugar content as water will freeze before the sugar in solution. Makes sense but I had to test it out a couple of times. My results lead me to the conclusion that while that may very well be important and useful to those making sugar/syrup it was not that important to me making beer. The first time I collected my sap and removed the ice I found the sap with ice removed was about 4.5 brix. So, yeah it was a bit higher. Once the ice had melted and come up to temperature for an accurate reading on my hydrometer (60°F) I measured that as well. It was not completely negligible in my mind. It was about 1.5 Brix. Yes much lower but not completely water. The second time I got similar results, a bit higher at 2 brix. It amounted to 1 quart. 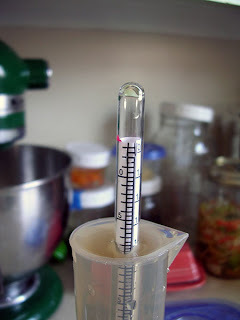 So I reduced it for kicks down to 1 pint resulting in a reading of 4.75 brix or 1.016 SG. I then further reduced it to about, oh, 5 TBS! Resulting in 20 brix (1.078 SG) and it was wonderful! Not quite syrup strength but sweet and tasty! There is an homebrew competition coming up on April 4th over in Littleton, NH. 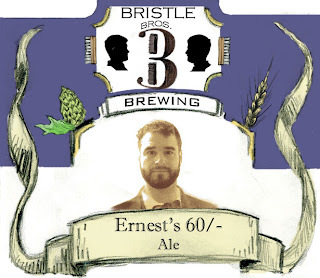 So in preparation for that I have been making some new labels for the brews I am entering. Plus it was good motivation to start the process of my overall redesigning of my labels. I did not have the time to carve and print new labels. I did not want to rush that this time around as I did for my first set. So as a compromise I drew them with pencil, scanned them and worked with photoshop. I added color in photoshop and used some old (and not so old) family photos as well. Later they will be engravings/woodcuts when I am satisfied with the designs and I have the time to work on them. The last one there I did my best to make the photo appear old. I am no photoshop whiz by any means so, I know it is not very believable. I am pretty proud of one part of the job though. "Old" Ernest there was not looking spiffy enough dress wise in the original photo so I did a little dress up with him. I "borrowed" an old daguerreotype portrait I found online, more specifically I borrowed the clothes of the person in the image and put them on my bro. So if you recognize the attire as a distant relative of yours, thanks for the loan, very sharp, just what I needed. I'll post a picture once they are on the bottles. I designed these specifically for the short stubby type bottles that breweries such as Sierra Nevada, North Coast and Boulevard Brewing use as I like those bottles and have a pretty good collection of them. Yes, though I keg I still have a plentiful amount of bottles. These will be going on plain old long necks though for the competition. 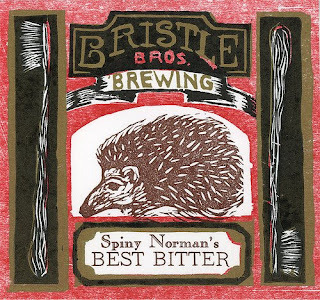 Since part of this blog is supposed to be about my printmaking as it relates to my homebrewing anyway, it is past due that I post some artwork. I have sadly not been very productive in the print/art interests in my life lately. I have been working slowly on redesigning my beer label design. I will post my progress, but first I will revisit my first attempts. The following are my first hand-printed woodcut/engraving labels. The second one was awarded honorable mention in the BYO magazine homebrew label competition in 2006. These both are printed from multiple blocks to print each individual color. They are a combination of linoleum block, woodcut, and wood engraving. This was only my second serious attempt at wood engraving. The results were a bit wonkier than I would desire. It is not really up to my usual standard. It was a start though. 0.6 or 6 no big diffeence eh? Ah man! I was at my local homebrew supply store today. I noticed the Northern Brewer hops were labeled as 10.6% Alpha Acid. I bought some of these a couple of weeks back when they had just came in before he had repacked them in 1 oz. packs. I verified with the owner that this 10.6% batch is indeed the same I had purchased. Problem here is that the 4 oz. package he made for me was labeled as 6%!!! So, I now have a hop bomb Altbier! Well, that is not the only problem with this altbier I guess. I forgot to mention in my previous post how my efficency suddenly crashed on that batch. I went from 80% or above to 69%. Not sure what happened. I am wondering if it had to do with the age of the grains. I ended up with low gravities. Well, I really just wanted the yeast anyway! 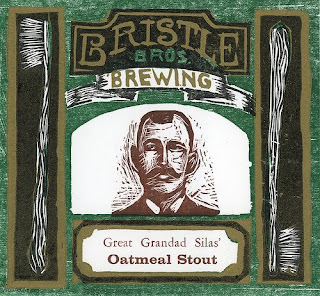 Charles Bristle is the homebrewing alter ego of Dave Brush and the older brother of the Charles and Ernest Bristle Bros. Brewing "company"